All this said, the Japanese do have certain characteristics that reflect their unique history and interaction with their environment. First, Japan is an island nation. Second, until WWII, Japan was never conquered by an outside power, nor was it heavily influenced by Christian missionaries. Third, until the beginning of last century, the majority of Japanese lived in close-knit rural farming communities. Fourth, most of Japan is covered in steep mountains, so the few flat areas of the country are quite crowded – people literally live on top of each other. Finally, for almost all of its history, Japan has been a strictly hierarchical place, with something approximating a caste system during the Edo period. Many visitors to Japan worry about committing a dreadful breach of etiquette. Perhaps this is natural. After all, Japan is a relatively formal society with a complex system of manners and mores. And let’s not even get into the language, which makes the tu/vous questions of French look like child’s play. But here is something we cannot emphasise strongly enough: relax . No one expects you to know all the rules of polite Japanese behaviour and no one is watching you like a hawk, waiting for you to do something wrong. So, the first rule is this: just do what would be polite in your own country, and you won’t go too far wrong. That said, there are a few things to keep in mind if you want to gain bonus points with the locals. » Use two hands when giving your name card or receiving one. Ditto for presents or important documents. 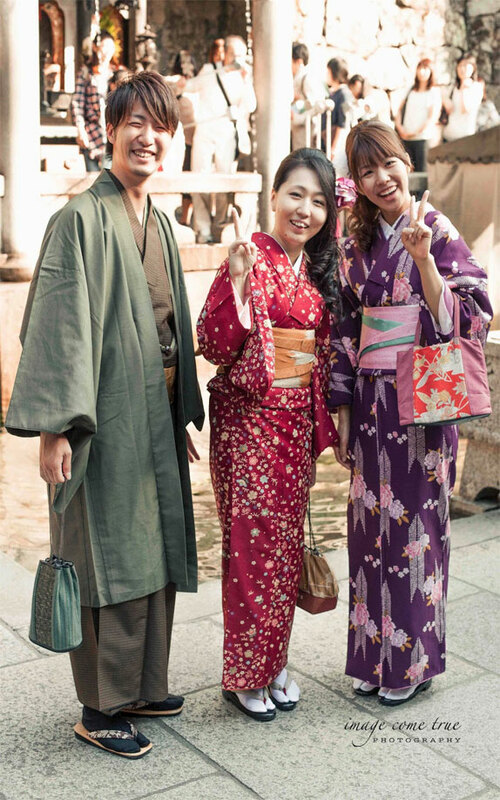 The overwhelming majority of Japanese live in the bustling urban environments of major cities. These urbanites live famously hectic lives dominated by often gruelling work schedules and punctuated by lengthy commutes from city centres to more affordable outlying neighbourhoods and suburbs. Until fairly recently, the nexus of all this activity was the Japanese corporation, which provided lifetime employment to the legions of blue-suited white-collar workers, almost all of them men, who lived, worked, drank, ate and slept in the service of the companies for which they toiled. These days, as the Japanese economy makes the transition from a manufacturing economy to a service economy, the old certainties are vanishing. On the way out are Japan’s famous ‘cradle to grave’ employment and age-based promotion system. Now, the recent college graduate is just as likely to become a furitaa (part-time worker) as he is to become a salaryman. Needless to say, all this has wide-ranging consequences for Japanese society. Most Japanese identify themselves as both Shintō and Buddhist, but many young Japanese get married in Christian ceremonies performed by foreign ‘priests’ (many of whom are not real Christian priests). Most families once comprised a father who was a salaryman, a mother who was a housewife, kids who studied dutifully in order to earn a place at one of Japan’s elite universities, and an elderly in-law who had moved in. Although the days of this traditional model may not be completely over, it has been changing fast in recent years. As in Western countries, tomobataraki (both spouses working) is now increasingly common. The kids in the family probably still study like mad: if they are in not yet in high school, they will be working towards gaining admission to a select high school by attending an after-school cram school, known as a juku; if they are already in high school, they will be attending a juku in hopes of passing university admission exams. As for the mother- or father-in-law, who in the past would have expected to be taken care of by the eldest son in the family, they may have found that beliefs about filial loyalty have changed substantially since the 1980s, particularly in urban centres. Now, more and more Japanese families are sending elderly parents and in-laws to live out their ‘golden years’ in rōjin hōmu (literally ‘old-folks homes’). Only one in four Japanese live in the small farming and fishing villages that dot the mountains and cling to the rugged coasts. Mass postwar emigration from these rural enclaves has doubtless changed the weave of Japanese social fabric and the texture of its landscape, as the young continue their steady flight to the city, leaving untended rice fields to slide down the hills from neglect. Today only 15% of farming households continue to make ends meet solely through agriculture, with most rural workers holding down two or three jobs. Though this lifestyle manages to make the incomes of some country dwellers higher than those of their urban counterparts, it also speaks clearly of the crisis that many rural communities are facing in their struggle to maintain the traditional way of life. The salvation of traditional village life may well rely on the success of the ‘I-turn’ (moving from urban areas to rural villages) and ‘U-turn’ (moving from country to city, and back again) movements. Although not wildly successful, these movements have managed to attract young people who work at home, company workers who are willing to put in a number of hours on the train commuting to the nearest city, and retirees looking to spend their golden years among the thatched roofs and rice fields that symbolise a not-so-distant past. Japan has a population of approximately 127 million people (the ninth largest in the world) and, with 75% of it concentrated in urban centres, population density is extremely high. Areas such as the Tokyo–Kawasaki–Yokohama conurbation are so densely populated that they have almost ceased to be separate cities, running into each other and forming a vast coalescence that, if considered as a whole, would constitute the world’s largest city. One notable feature of Japan’s population is its relative ethnic and cultural homogeneity. This is particularly striking for visitors from the USA, Australia and other multicultural nations. The main reason for this ethnic homogeneity lies in Japan’s strict immigration laws, which have ensured that only a small number of foreigners settle in the country. The largest non-Japanese group in the country is made up of 650,000 zai-nichi kankoku-jin (resident Koreans). For most outsiders, Koreans are an invisible minority. Indeed, even the Japanese themselves have no way of knowing that someone is of Korean descent if they adopt a Japanese name. Nevertheless, Japanese-born Koreans, who in some cases speak no language other than Japanese, were only recently released from the obligation to carry ID cards with their fingerprints at all times, and some still face discrimination in the workplace and other aspects of their daily lives. Aside from Koreans, most foreigners in Japan are temporary workers from China, Southeast Asia, South America and Western countries. Indigenous groups such as the Ainu have been reduced to very small numbers, due to intermarriage with non-Ainu and government attempts to hasten assimilation of Ainu into general Japanese society. At present, Ainu are concentrated mostly in Hokkaidō, the northernmost of Japan’s main islands. The most notable feature of Japan’s population is the fact that it is shrinking. Japan’s astonishingly low birth rate of 1.3 births per woman is among the lowest in the developed world and Japan is rapidly becoming a nation of elderly citizens. The population began declining in 2007, and is predicted to reach 100 million in 2050 and 67 million in 2100. Needless to say, such demographic change will have a major influence on the economy in coming decades. Increasingly, however, Japanese women are choosing to forgo or delay marriage in favour of pursuing their own career ambitions. Of course, changing aspirations do not necessarily translate into changing realities, and Japanese women are still significantly underrepresented in upper management and political positions, and there is a disproportionately high number of females employed as OLsoutsiders, Koreans are an invisible minority. Indeed, even the Japanese themselves have no way of knowing that someone is of Korean descent if they adopt a Japanese name. Nevertheless, Japanese-born Koreans, who in some cases speak no language other than Japanese, were only recently released from the obligation to carry ID cards with their fingerprints at all times, and some still face discrimination in the workplace and other aspects of their daily lives.